William F. Holden, CCIM is the president and founder of William Holden International Realty. He has an varied and extensive background. For 37 years, he was an airline pilot. He started with Trans World Airlines (TWA) and spent the last years of his career with American Airlines. During this time, he was also a real estate developer in Vail, Colorado, USA (1972 to 1986). While in Vail, he developed town homes and multi-family condominiums in a ski resort and golf course setting. He also acted as general contractor, architect, sales manager, and property manager for all properties he developed. From 1986 to 2001, William was an appraiser in St. Louis, Missouri, USA where he did investment analysis on shopping centers, office buildings, industrial office warehouses. He also analyzed residential apartment properties. From 2001 to 2005, he had an asset management company and provided investment analysis as a registered investment adviser with a Series 7 securities license. From 2005 to present, William has made many investments in residential real estate on the north coast of the Dominican Republic. In the process, he set up a full-service real estate company in Cabarete to include property management, rental management, and sales. OUR STORY – Holden Sotheby’s International Realty began as Cabarete Lifestyle Resorts. It was founded by William Holden, retired airline captain. After investing in numerous real estate developments in the Dominican Republic, William could not find anyone who matched his management style (and skills) to manage his own properties. So, he started his own company. William had an extensive background in real estate and attained the prestigious CCIM designation (Certified Commercial Investment Member) which is often referred to as the PhD of Commercial Investment Real Estate. Cabarete Lifestyle Resorts began in property management and condominium administration, then progressed into rental management. Since the Cabarete office was professional and well-located, the next logical step was real estate sales. William was unique in that he seemed to be the only licensed real estate broker in town. Moreover, he continuously stays current with USA National Association of REALTORS® continuing education requirements and courses in business ethics. In addition, the CCIM education and professional ethics requirements give him additional stature. MAIN GOAL – When Cabarete Lifestyle Resorts was first founded, William’s main goal was to hire Dominican employees because in his view it was his contribution to the community. In doing so, and in the training he provided, he has set up his Dominican associates with work-skills that will be useful to them for the rest of their lives. Along the way, life-long friendships developed. When the decision was made to place more emphasis on sales, William sought out an International alliance that would help the world realize the benefits of visiting and investing in the Dominican Republic. In his opinion, the company with the best international branding and unquestionable integrity was Sotheby’s International Realty®. In turn, William was fortunate enough to be approved as an affiliate for Sotheby’s International Realty. We are now in the process of adding offices to different parts of the Dominican Republic. Because of this expansion, we have changed our name from to William Holden International Realty, which will reflect our expansion to other parts of the country. FAMILY LIFE – William and his wife Susan have a home in St. Louis, Missouri USA. 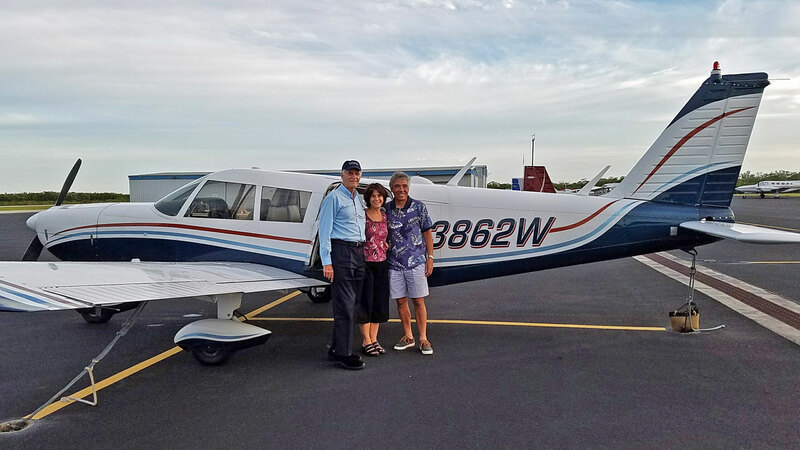 As a retired captain with American Airlines, both Susan and William have travel benefits for life. As such, they travel back and forth between the USA and Dominican Republic quite often. Susan has her own real estate business in the United States and plans to work with William Holden International Realty on a seasonal basis. And yes… there is Gracie — our black and white English Cocker Spaniel. As you can imagine, our life sometimes revolves around her. Our major goal in life is strong relationships with family, friends, and business associates. We love the Dominican Republic because of the warm and gracious culture of the Dominican people. Then there’s the weather; it just great all year-round. We specifically love the north coast and look forward to building long-lasting relationships — both with our Dominican friends and international visitors. In our opinion, the Dominican Republic is still waiting to be discovered. It is truly a diamond in the rough. We love flying our Piper Cherokee Six 260 around the DR. Whether it be flying over lush green tropical forests or following the ocean front around the island, the sights are breath-taking.